If you were not here to enjoy Falmouth Week 2012 then you will be pleased to hear that there is yet another great festival on the way. The premier of the ‘Splash’ festival begins this Friday 7th to celebrate Cornwall’s inspiration for creativity. Running through until 16th September events include, Dance, Drama, Literature, Art & Design all coming together in one colourful week. 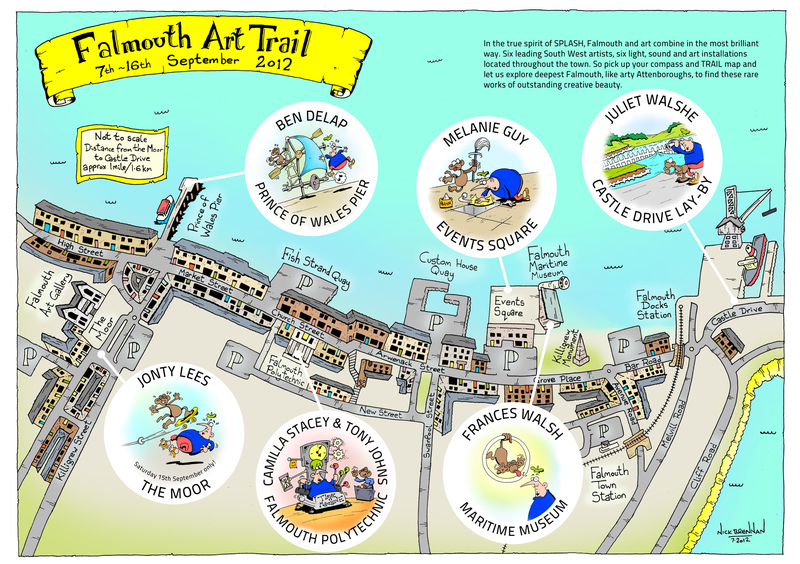 Falmouth Art Trail:- Wonder through the town from Falmouth Moor to Castle Drive and discover light, sound and art installations by six of the SouthWest’s top artists. Ben Delap, Melanie Guy, Juliet Walshe, Jonty Lees, Frances Walsh, Camilla Stacey & Tony johns. When you find each instillation why not Tweet it to @VisitFalmouth or post it up on our /VisitFalmouth Facebook page? Acclaimed photographer David Chapman will be exhibiting images of the Cornish landscape in 13 shop windows throughout Falmouth. Davids book, ‘Exploring the Cornish Coast’, is number six on the geographical bestseller list for Amazon. Tweet or Post up your favourite images so we can go and have a look too. Brewery Yard – Old High Street:- An exhibition of abstract art and illustrations by established and up-coming artists. If you missed their fantastic original performance at Gyllngdune Gardens at the start of summer then here is another chance. The ‘Doorways’ project celebrates unusual doorways and how they frame the Cornish landscape. You have to see it to get a handle on it! Emily Barr lives in Cornwall with her family. Her first novel, ‘Backpack’, won the WH Smith New Talent award. Since then she has written 10 novels the latest of witch, ‘Stranded’, was published in May 2012. Liz Fenwick – Lives between her home in Dubai and Cornwall. Her latest novel, ‘The Cornish House’, was inspired by the history of Cornwall and its people. Katie Fforde – Her novels have been described as, ‘top drawer escapism’, by You magazine and, ‘…Jilly Cooper for grown-ups’, by the Independent. Inspiration for her novels is drawn from everywhere including ads at the back of magazines and overheard conversations among her choir. I wonder what hse will draw from the conversations at, ‘Girls night in’, after a few glasses of wine. Judy Astley – Inspired to follow her ambition to write after filling in an application form for an Art Degree, (not surprising since most application forms are the length of a novel), Judy has since written 16 novels. ‘The Look of Love’, published in January this year, was shortlisted for the RNA Romantic Comedy of the Year. What better way to spend an evening than hanging out with the girls and talking ‘chick lit’? Tickets are £5,(to include the all important glass of wine), available from Falmouth Bookseller.